The Free RPG Blog: 1KM1KT, Free RPG Blog 24 Hour Competition Winner! Three months, three judges, thirty games, twenty four hours. Thirty days of judging, reading, reviewing, chatting and much wringing of hands and weeping like widows. The quality was high, the ideas broad and novel and everyone at 1KM1KT is thrilled that the entrants threw themselves into it. At the end, Keeton was presented with a shortlist of three that the judges (Chainsaw Aardvark, Kumakami and I) all agreed were tip top. So good, in fact, that I am forced to review as many of the entrants as I dare over the next few weeks. I wish there was a way we could have many winners because so many deserved to do so. Complete, neat and met all of the rules to a tee. Weird? 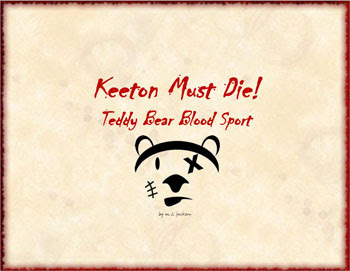 You bet, gladiatorial teddies possessed by evil spirits that rebel against Dr. Keeton. They must have revenge. A full review is on the way. Seeing as Keeton, the GLORIOUS BENEFACTOR of 1KM1KT had the final say, it's rather odd that he chose the one with "Keeton Must Die" in the title. Odd? You betcha.